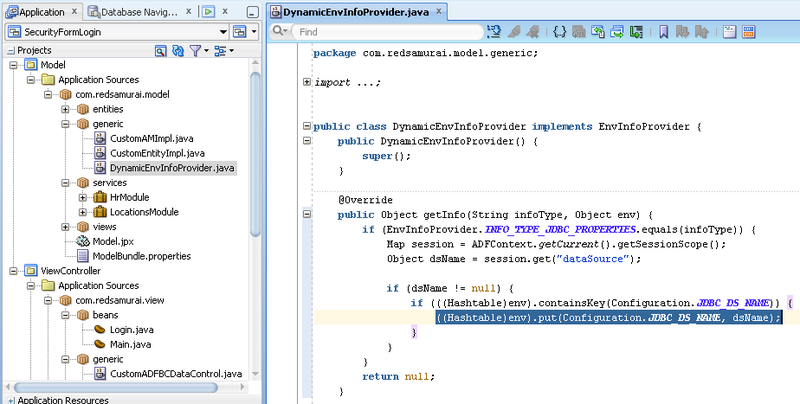 I was preparing proof of concept for such scenario, where ADF application was working with multiple data sources. Requirement was to be able to select data source on runtime, before login. We had several DB users, different DB security applied to each of them - separate data source was defined. Different data source per business site, not really per business user - this would be too much. I would like to post and describe prepared sample application. 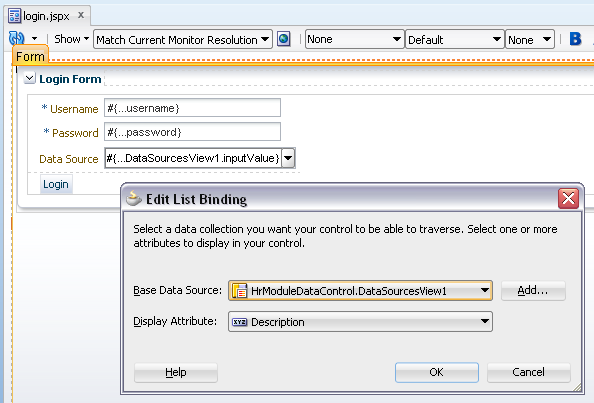 Data Source runtime switch is implemented based on concept described in Jobinesh blog - Modifying the Application Module's JDBC DataSource at run time. Download sample application - UserDataADFBCSample_v3.zip. This sample is based on application from my previous posts, it is enhanced with Data Source selection from login page. Hi , God Bless You for this nice article . 1 - Get DEPT data from one MSSQL datasource and create DEPT Entity Object . 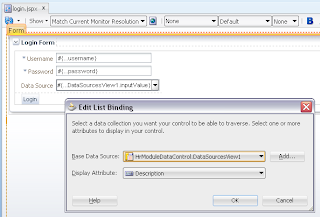 2 - Get EMP data from another MSSQL datasource and create EMP Entity Object. 3 – Create a new View Object base on these two Entity Objects and create a connection between them. Your solution is good for switching between two datasources at runtime but I need to work simultaneously with two datasource at runtime . In php or .net we could create two different classes for connecting two different datasources at runtime and working with them concarrently. We could create relations in record sets or datatables.How we can overcome this challenge in Oracle ADF ? when the login time i will select schema name its not a datasource.how can we handle this situation based on the selected username and env(schema) how to dynamically connect the particular schema.how to bind from the single UI to access based on the user and env(schema selected). 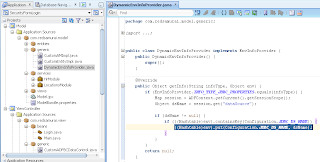 Hi, to run the sample you offered, which jsf implemention is required. When i opened the project in jdev, got compilation errors for faceCTx. But deployment fails with "Caused By: java.lang.IllegalStateException: Application was not properly initialized at startup, could not find Factory: javax.faces.context.FacesContextFactory". I'm using jdev, 11.1.1.6 along with integrated server. I tried to create my own project like yours, but the url ""/adfAuthentication?success_url=/faces/main"", gives 404 error. Not sure what is causing the issue. 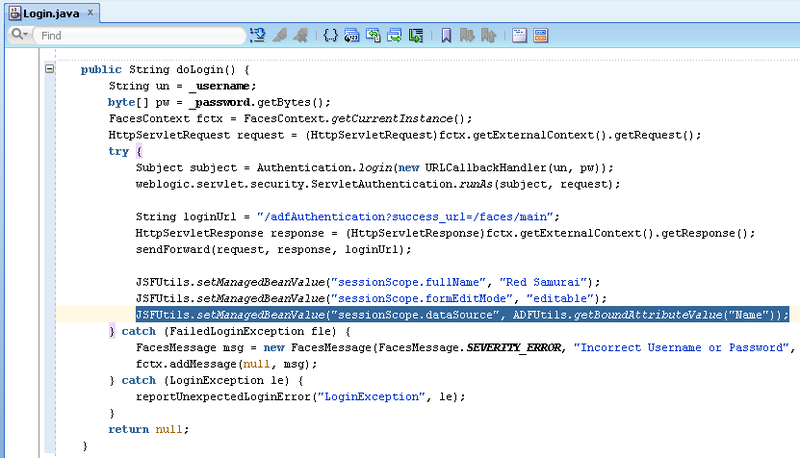 I just hard coaded user to default weblogic/weblogic1. Authentication does not throw any errors. You can run this sample app with ADF 11g R2. If you want to run it with ADF 11g R1 - you should copy paste web.xml and weblogic-application.xml content from another ADF 11g R1 application. Also change all Facelet files to be JSPX. Hi, i tried with Jdev R2. And getting following exception with integrated server. java.lang.IllegalStateException: was not present on this page; tag oracle.adfinternal.view.faces.unified.taglib.UnifiedDocumentTag@76ee18encountered without an being processed. It works on my machine, something wrong on your environment. i just created a new jspx page and tried it was working. Then just changed the url to point to login.jspx, it started to work.. i did not change anything.. Anyway the functionality that i wanted got it working. Thanks a lot.. I don't understand how this works with AM pooling. An AM is configured for a datasource. If you change the datasource on an AM and it gets checked back into the pool and then gets passivated when another user gets it who had selected a different datasource at login will the AM reconfigure each time its' checked out of the pool. Using more than one datasource is as simple as configuring one app module for one datasource and another app module for a different datasource which we do in our application. But I don't understand how switching the datasource on the fly like you described will work with AM pooling. Having different AM's per data source is quite primitive, often new data source can be created - we are not going to create new application module and redeploy app each time. Your concern is false. This approach is stress tested with AM activation/passivation. When AM is checked back from the pool - then Data Source is reapplied again. When you have a page that displays data from two different databases you have to use a separate app module. You can't query two different databases from the same app module. Unless you created use a database view in the database itself that used a external link to the external database. You describe different use case - accessing different DB's from the same session. Use case presented in this blog is different - different database access for all AM across entire session. To enhace this more further. 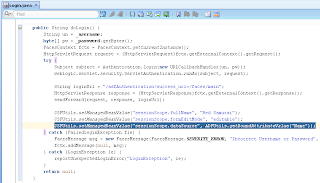 How can we get list of JDBC Data sources available in weblogic in the ADF Application. hi Andre can we get the same database connection wizard on our page ,i mean dynamic database for our fusion application at runtime we change the connection and it will reflect the changes at the back end or I would like to know what happens when we changes database connection in application sources which file get affected ,how it changes and the flow of the database connection . Are you using Oracle Fusion Applications? Or you have custom made ADF application? 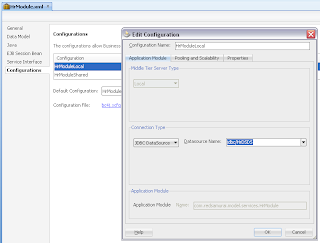 hi Andrejus, I have created two ADF fusion web applications one is using oracle Database connection with EO VO ,Am and other one is using Sql Server connection. And now I have created a third ADF fusion web application which is a main application in which i haven't created any adf business component,in that main application i have created one jspx page and i have added jars of previous two applications in main application through dynamic region i have dragged their task flows in my main application page as a link. according to our databases i also created the DataSources in weblogic which we are using in our application. 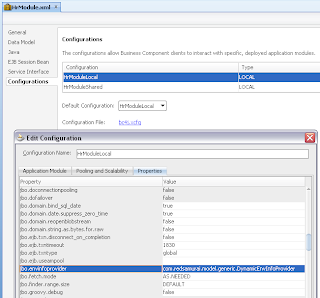 when i make my main application run then the oracle connection TF link is working but when i clicked on Task Flow link which contains SQL server connection the table i have used in the page fragment of that task Flow . ("Doesn't throwing any error or exception ")but is not displaying records and message coming "Access Denied". Is that possible to access different databases in single Fusion web Application ,in the above mentioned. There’s one thing worth noticing. If you create your entities with New Entity Object wizard instead of Business Components from Tables - schema object prop of Entity gets prefixed with database schema name. You get HR.COUNTRIES instead of only COUNTRIES and it propagates down when creating (or updating) view objects. And you can’t have two db schemas sharing name on one db server – switching DS in that case will give you query errors. Otherwise great article, very helpful. Keep up good work! Thanks for your update. Makes sense, developers should make sure EO's universal naming (without schema prefix). Hi Andrejus. This posting is great. But could the data source be switched whilst in the application i.e: after login has happened. Yes, this should be possible - but I don't have ready sample app to share. I would need to implement it and test. Suppose there are 2 jsff's in a taskFlow. Is is possible for the different jsff's to use different data sources ? Thank you for this great article. 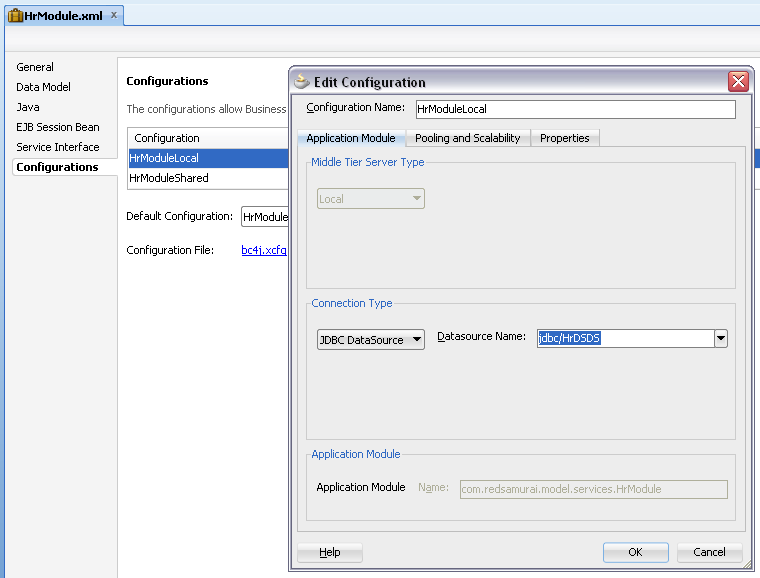 I tried your code in jdeveloper 12.0.3 but I cannot manage second DC although I created one in weblogic server. Is there any specific configuration to do for latest version of jdeveloper? I will need to test it with 12c. Thank you Andrejus, I would be pleased if you could. We upgraded to 12c as well. Switching datasources worked well in 11g. But there seems to be issues in 12c. We had to change the Shared property on the pageflows to Isolated. This works for the individual screen. But the menu refuses to get refreshed based on the new datasource. So, Yes, I am also waiting for the outcome of your 12c test. You should be careful switching to TF Isolated, it will consume more resources - each TF will use its own AM instance. I think next week I will have time to test this, I will post outcome on the blog. Much obliged to hear that. I am looking forward the test results. I hope it works fine in 12c also. I did a quick test and it doesn't work on 12c, could be multiple reasons and several fixes could be tested. I will need to spend more time on this, but right now pretty busy with my work. I will look at it later. Did you have a chance to look at the case? Not yet. Too busy with projects and customer work. Also preparing new blog articles. No, when I will look into it and have solution - I will post it. Too busy with projects and preparation for OOW session and ongoing topics for blogs. Somehow I managed to do what I asked you before by using Steve Muench's famous example/approach. But I have another issue which is not directly related to this case : I created a simple ADF application which uses a mysql database. I deployed it on internal WL app. server and it can connect the mysql database and shows a table data. But when I modify and prepare the same app and deploy on glassfish, it behaves strange and display different data from another mysql database's table. Both databases have the same schemas and tables but different data. For WL version I have used standard JNDI Name for a Datasource (e.g. 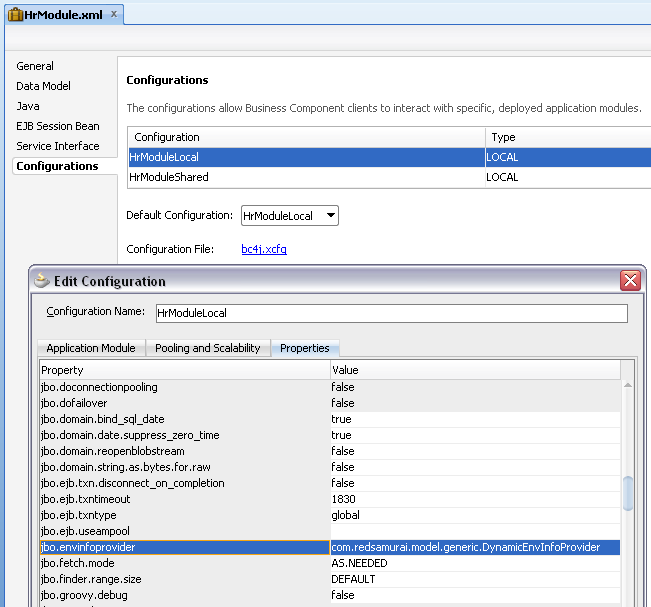 java:comp/env/jdbc/YourConnectionDS) in app modules configuration and for GF version I create pool and connection (e.g. jdbc/YourConnectionDS) for the same database. But GF version still uses local database which run on GF system. Do you have any idea or time? No, I wasnt looking into it. Thank you so much for such helpful post. The link provided to download sample application is not workking, could you please make it available or it will be a great favor, if you will send me the application on my email: muddasaramin70@gmail.com. I'm sorry, but I am not able to find the application from the link also. Please help! and Uncheck the "Enable Application Module Pooling"
For further assistance, please see the community thread. You should never uncheck "Enable Application Module Pooling". This will force application to work without AM pool and will do passivations/activations on each request. This is not acceptable in any ways. I have followed your blog and executed your project in 12.2.1.0.0 version . But somehow I could not able to switch DB instance . Could you please suggest .